Red Dot for air pistol? I have both an IZH46M and a Daisy 747 that I shoot indoors at home. My eyes don't work so well with open sights anymore and I would like to put a red dot on one of these. The Sun Optics mount works on both, so that is taken care of. I'd like something lightweight, but don't want to spend over $100 unless I have to. I think a reflex sight would work best, but don't have any experience with these. Anything you can recommend? 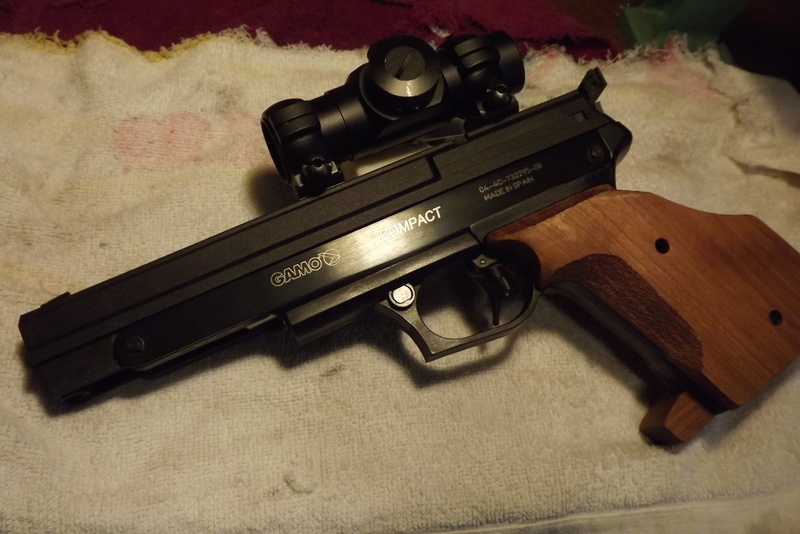 If something like a Vortex Crossfire is best I can go with that. Re: Red Dot for air pistol? I've got a Vortex Venom and the dot is very high quality but is twice your budget. My only issue with reflex sights is sometimes its hard to find the dot, not really a problem with air pistol but could be during rapid fire with a 45. 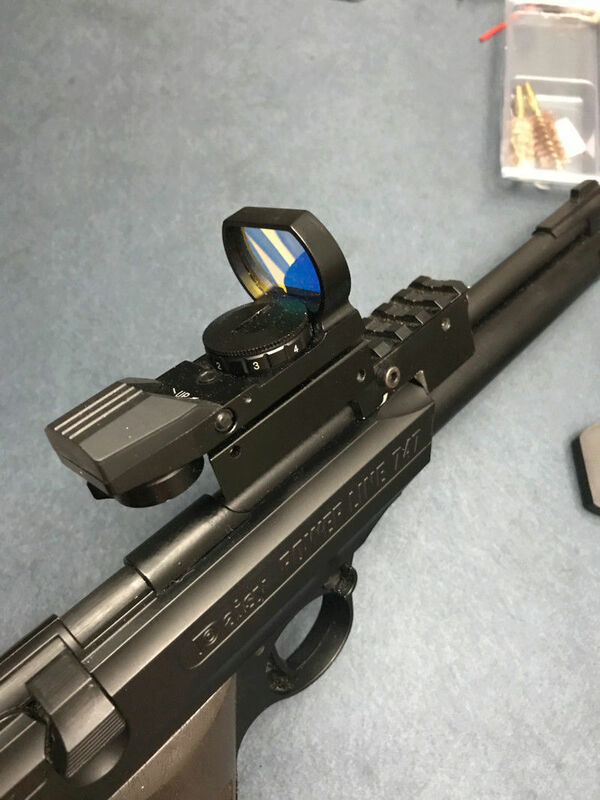 If you're shooting indoors, you can get an ADCO sight, for about half your budget. Quite nice, and very light! I used the sun optics mount and bought a cheap reflex dot on Amazon for my 747. I think the dot I got was a dagger defense brand, maybe $20. My plan was to buy a nicer reflex dot if I liked the setup. It’s been about five months now and the dot has done great. I’ve shot at least 2000 pellets with it. The gun felt front heavy to me so I modified the mount to move everything back. I ended up with an ADCO on my air pistol. It is holding up nicely. Thanks for the responses. I was wondering if anyone has compared the Bushnell TRS25 to the Primary Arms Microdot. They seem comparable. In my view only, Primary Arms has a nicer dot than Bushnell TRS-25 - more round and less starring. The two I have did not hold up on slide mounts for 9mm and .45 ACP pistols but performed well on frame mounts and on .22 slide mounts. So, should be fine for the air pistol. I have a TRS25 on my 747, so far so good. Nice round dot good glass. I've got about 400 rounds through the pistol with it to date. LenV wrote: I ended up with an ADCO on my air pistol. It is holding up nicely. Is it the 30 mm and did it come with the rings included? Did you also consider the Tasco 30 at half the price? Thanks Len. It'll cost me but I'll follow in your steps. Often wondered about the Millet which goes all the way to 10 moa. That is one big dot, is it for real? Pretty sure the 10 is for a shotgun. I get the 4moa. Any image reduction with the Adco? I have a Burris FF#3 on my FWB 603 (3 MOA). Very happy with it. I use the same sight on several other pistols as well. Blsi2600 wrote: Any image reduction with the Adco? No image reduction. I have an ADCO on a model 14, Garmin and a high power pellet rifle. I have Aimpoints, Ultradots and Sightrons on my Bullseye pistols. With some others I am trying out. Vortex venom isn't a good choice for indoors. It doesn't dim down enough. Fast fire 3 or matchdot 2 but they are both higher priced. 30harry wrote: Vortex venom isn't a good choice for indoors. It doesn't dim down enough. Fast fire 3 or matchdot 2 but they are both higher priced. Says who? My Venom is great for indoor air pistol practice. OK, I take it back. After your post I went to compare my Vortex Venom with my Fast Fire 3 and now I see it looks like I have a problem with my VV. It appears to be stuck in "auto" mode. And in lower levels of light the dot is too bright on auto mode. I discovered it was in auto mode by turning the lights on and off and putting it under a bright light. And it won't switch to manual mode. I'm going to try a new battery tomorrow to see if that helps the problem. If not, I have to find out how to make use of the "lifetime warranty". All this time I thought they made the dot too bright and all along I had a problem with mine. If I had two of them I could have seen this a long time ago. Thanks for making me find out I have a problem with mine. I looked at mine again last night, on the lowest setting it is quite usable. Its not like my Aimpoint 9000sc dots that have 2/3 of the setting unusable (too dim, many are for night vision). I'm not sure if I've ever accidentally gotten mine on auto mode. Air Venturi V10. Magpul MOE rail for the red dot. LForbes wrote: Air Venturi V10. Magpul MOE rail for the red dot. ....thanks to you giving me tips on how to mount the scope rail!! !